GetResponse Vs Active Campaign: Simplicity Vs Complexity, Complete Online Marketing Tool Vs Limited Options! GetResponse is a winner in the marketing automation world because it’s rich in features, simple to use, and affordable. Similarly, Active Campaign also offers an all-in-one marketing platform. It’s affordable but all that low price comes at a serious cost – high level of complexity. In this comparison review, let’s see where Active Campaign stands against an online marketing tool like GetResponse that is ideally targeted at SMBs and online marketers. Active Campaign is an equally powerful marketing automation tool as GetResponse. In fact, it has a few more features including form abandonment actions, customer journey analysis, and transactional emails. But that is where the advantages stop. Try to build workflows and you will realize why GetResponse is miles ahead. GR has an intuitive, highly visual and user-friendly drag-and-drop editor. Create the most complex workflows with utmost ease. The editor in Active Campaign is not only too complicated, it is confusing too. References keep opening in new tabs. Besides, you cannot build complex workflows in it. Conditions – Create automated events based on user behavior – clicked, purchase, cart abandoned. Actions – Set automated actions based on conditions being met – send email, tag and score. Filters – Apply filters and boost the impact and target actions – range and amount. Use intuitive visual workflows for driving marketing communications – lead nurturing strategy, bring back customers, encourage purchase completions and notify your sales teams. Turn subscribers into customers by implanting tagging and scoring for precise segments. Rely on advanced tagging and scoring to boost your database value. Intelligence-based automations – Add conditions, start campaigns, update data, add branches, nurture or initiate sales processes based on conditions. Make use of visitor/user behaviors and interactions from your sites and apps. Use simple or advanced logic to create contact segmentation. GetResponse is a true all-in-one online marketing tool for SMBs and online marketers. It is a veteran email marketing company and offers one of the most complete email marketing solution. Active Campaign also offers a feature-rich email marketing platform. Email Creator – GR has an easy-to-use, drag-and-drop editor that allows editing templates, images, accessing basic blocks library and snippets archive, and keep track over email creation history. Use GetResponse’s own image editor. There are over 500 newsletter templates to choose from or create from scratch. Choose from over a thousand iStock images. Schedule delivery of newsletters at the time it’s likely to make the most impact. Import contacts to your list from multiple sources. There’s almost no limit to from where you can access it. Check your newsletter preview in subscribers’ inbox even before you send it. All the leading email clients are covered. Advanced email intelligence gives you metrics over time, segmentation with single click, email comparison, genuine email ROI report, autoresponder stats, social sharing stats, email client stats, and much more. Import contacts from multiple service and files to build your list. 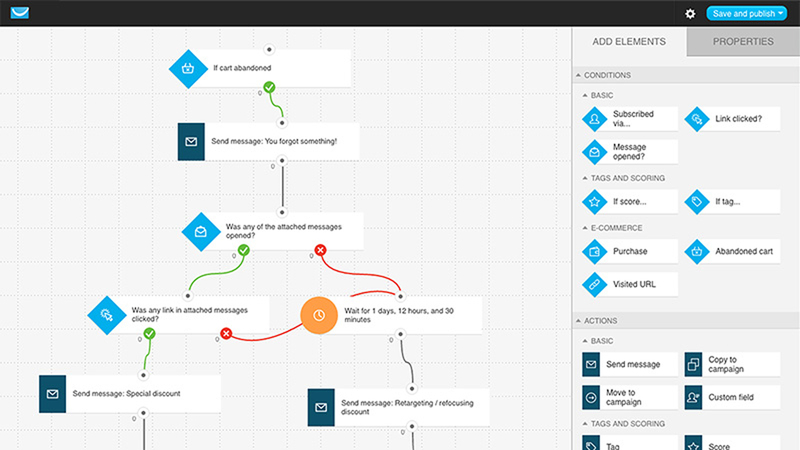 Intelligent behavioral based emails – automations based on actions. Get real-time access to email campaign performance. GetResponse has an edge when it comes to creating landing pages to boost your email campaigns. As with other aspects of its online marketing features, GR makes it extremely easy to create elegant and unique landing pages that help convert customers. It’s as simple as choosing a template, customizing it using a drag and drop editor, and publish it. Integration with all the commonly used analytics and remarketing services including Google Analytics, Kissmetrics, Google Tag Manager, Google AdWords and much more. With Active Campaign, you will have to use a third party landing page builder that integrates with it. GetResponse has an advanced autoresponder. In fact, they call it the Auto Responder 2.0. It keeps track of user actions and allows you to send out targeted messages accordingly. Send out messages based on opens and clicks, completed purchase transactions, any updates in contact preferences, birthdays, anniversaries and special dates, and much more. Auto Responder 2.0 also allows you to send out time-based messages to your subscribers. Segment and send out messages at times when you are likely to get the best-possible response. Active Campaign also you to create a large variety of automated campaigns using its Autoresponder campaign. The tool also allows you to send out time-based and action-based messages to your subscribers. Webinars allow you to keep your audience engaged and informed with powerful interactive messages. GetResponse offers the latest features within its webinar tool. Engage your you attendees with a wide range of tools including chats, whiteboards, polls, YouTube integration and much more. Active Campaign requires integration with third-party apps to develop webinars. GetResponse is much simpler and lacks any complexity. It is a more comprehensive all-in-one online marketing platform that is easy-to-use for anyone – beginners or advanced online marketers. Active Campaign has lower rates, but it lacks in many places. GetResponse has set the industry standards for value-for-money package. It is affordable for everyone including SMBs and online marketers and offers everything you need to succeed within the price. Active Campaign makes things complex and even advanced users find it too confusing. I have read a comparison of the email marketing tools and GetResponse is the winner. Could anyone share their experience with this tool please? GetResponse is most simple and easy to use tool in which Auto-responder will help more than we required.